SMOKING IS ALLOWED & ENCOURAGED!!!! Tonedeaf, a DJ and producer born in New Jersey with El Salvadoran roots, is pushing the boundaries of what open-format means in the electronic music scene. Tonedeaf prides himself on bringing the masses something original and fresh, all while remaining true to his roots. 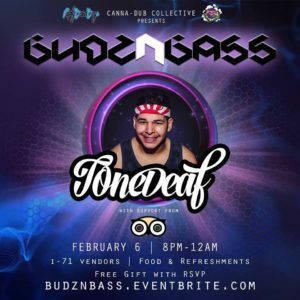 Constantly searching for brand new material and continuing his growth as an artist, Tonedeaf is on track for fresh and unique releases in 2018. Pilot Jones is your trip advisor.